Link to Interactive Map in the Matter of Randy Leach be viewed in its own Browser window for best viewing. 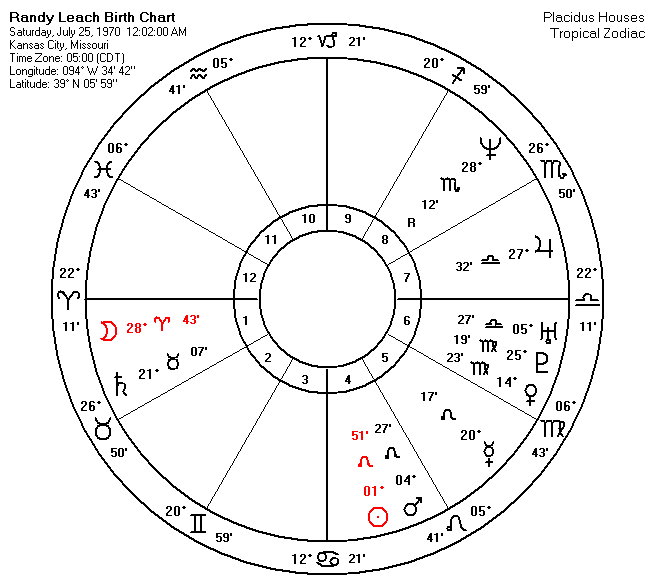 Sun Mars Leo CNJ - suggests his life could be at risk early in life. 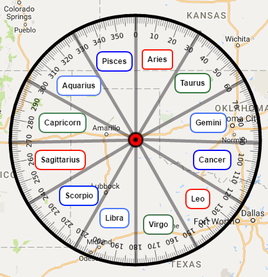 Mercury Saturn Neptune TSquare - difficult aspect ---the keywords here are Car, Stuck, Water. Mercury, Saturn, Neptune. 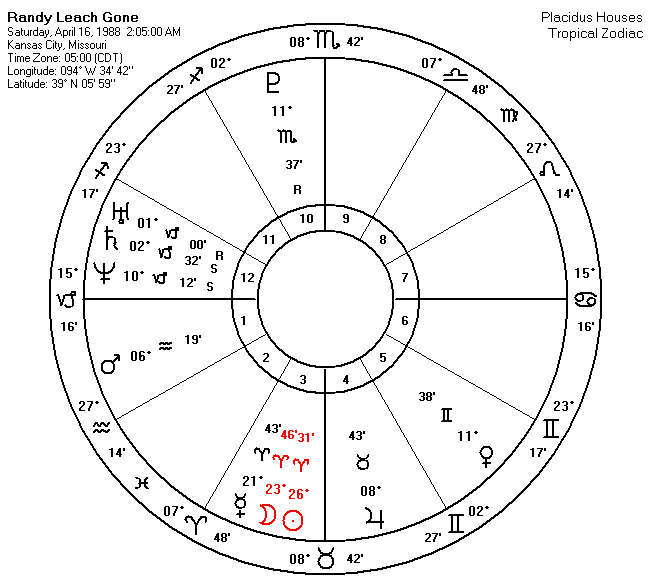 PSun applies to MercurySaturnNeptune TSquare - Progressed Sun activates this aspect and again suggests life could end at this time especially with Mercury ruling the 6th house of health. There is no surprise that there is interest and thoughts of Randy being in the water in the car since the car has never been located. Progressed Moon separates Natal Mars by 4 months - this aspects suggests to me a female interest could of come into his life about 4 or 5 months before his disappearance, and due to this aspect being triggered the night of disappearance by the Sun, makes me wonder if the only reason he went to this party was because of this interest in this female. Randy's own Sun Mars in the sign of Leo would make him very dignified in his self presence and it would certainly have him inclined to mature quicker than most teens his age ---especially in terms of responsibilities. So although he may have experimented with alcohol or a drug at some point in his high school years, any unfavorable incident happening because of them, would have him quickly turned him off of any further use. Dignity matters to Randy and I see no decided attraction to either of them in his chart. Transit Mercury Moon Sun Conjunct Ascendant - This is the aspect to me that suggests his death could come at this time, and that a search should be for remains. The connotation of Aries suggests to me that the death was swift. It's also the aspect that suggests to me it was accidental but also that he was not alone---some kind of playful rousing---as if there were others in the car with him---they got out but he didn't. I would effort to say three others involved, two males and a female. This aspect combined with the one below, leaves me with the impression Randy was not alone when he left the party in his car. 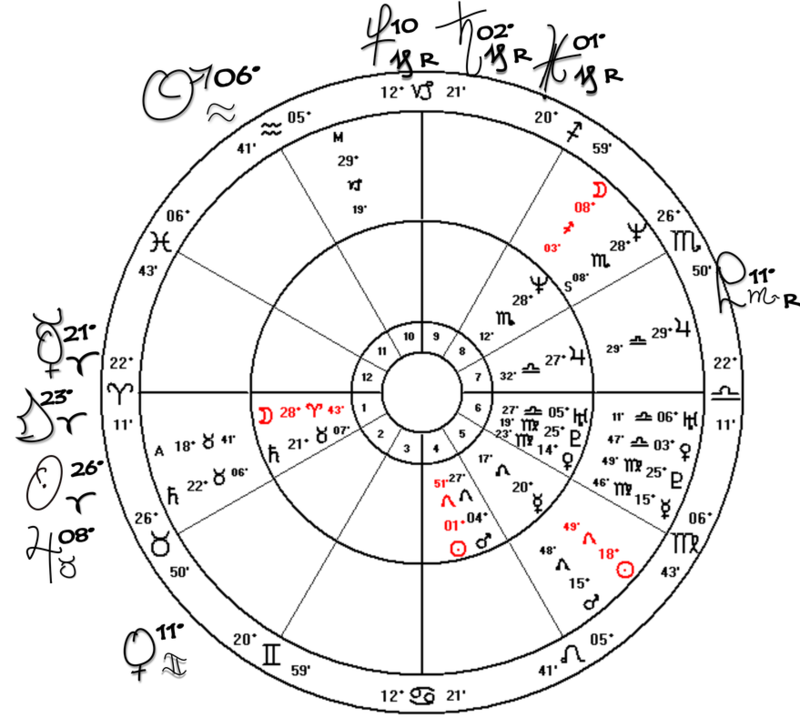 Transit Mars opposes Natal Sun Mars - The transit of Mars was separating from a conjunction to his own natal Sun Mars, gives me a sense that another male was sort of antagonizing him to go somewhere else after the party and there were others in his car. My thoughts are leaning over to some sort of road that is by the water, that could be a place where kids go to either sit in there cars and gather, or race them against each other? Was racing something Randy was interested in? I'm sensing from his natal birth stars and the transiting stars at the time of disappearance are suggesting he was coerced somehow through male banter of having his car be part of something that involved giving others a ride and it turned into a race of sorts---(its like these others weren't ready for the party to end) ----and that is the reason for the car going into the water--he/or they got out, but Randy didn't. Nothing in Randy's chart indicates to me that his death was on purpose or intentional, but an accident due to impulsive behavior by another. Here is one more thought, Randy's Mercury Saturn Neptune T-square that is suggesting he is in water in the car, is also ruling his 11th house of friends---so it is not unlikely that his death is a direct result of a action/decision made by one of his friends and/or their associates after this party. If you can determine who these friends might be and where they live, or where these teens went to race cars, or gather privately after the party---this very well can be the entry point of the car into the water. Hopefully, our map constructed on his behalf, will offer an area where the car could of went into the water, and also where it could be now. Any know areas such as places where the teens in town would go linger and possibly race cars against each other should be viewed against this map and the vectors. If you view our case study of other victims of strange disappearances measuring point of disappearance to point of recovery and take the time to watch some of our youtube videos on other cases that have been solved, such as Lucas Hernandez, Toni Anderson, Mariah Woods and Robert Bee you will get a better understanding of our work and how to use our map to plan your search efforts. 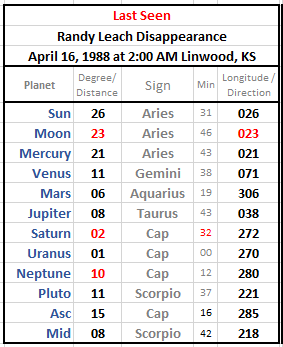 You will notice below, in this grid chart that illustrates the exact measurements of Randy's birth planets, that I have highlighted the measurement for the planet Venus. Venus was 14 degrees of Virgo when he was born; This measurement can otherwise be written as 164, which is Venus' total degrees of longitude along the ecliptic plane at the time of his birth, this same number is appearing as the date of disappearance, April 16, or 4/16. 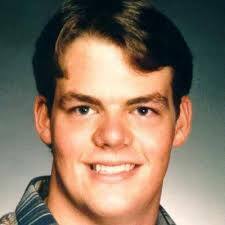 I don't know enough about Randy's life or his disappearance to connect any of his other numbers to life events or people through their dates of birth----but you can. Consider these numbers alongside what you know about the people connected to Randy and the night of the party as well as the roads nearby that could of been used after the party dissembled. When we are born, we come into this universe while it is in its regulatory cycle---that cycle is ours, and from our work in this vain we know that these numbers could very well play into any of the numeric facts hinged to this case. What I found interesting about this specific measurement, is that Venus in Randy's birth chart is in Trine to Saturn the same planet that is involve in his natal TSquare also involving Mercury and Neptune, car and water---what I want to add here is that Venus as the ruler of his 7th house of relationships sort of confirms for me that this incident of his car being in the water must somehow involve both someone who he knew and that a female could very well have been present. In addition, Venus by progression was moving forward towards Uranus the planet of friends/groups, so again my suspicion is that there was more than just one other person involved here, even if they were just standing by and watching it happen.